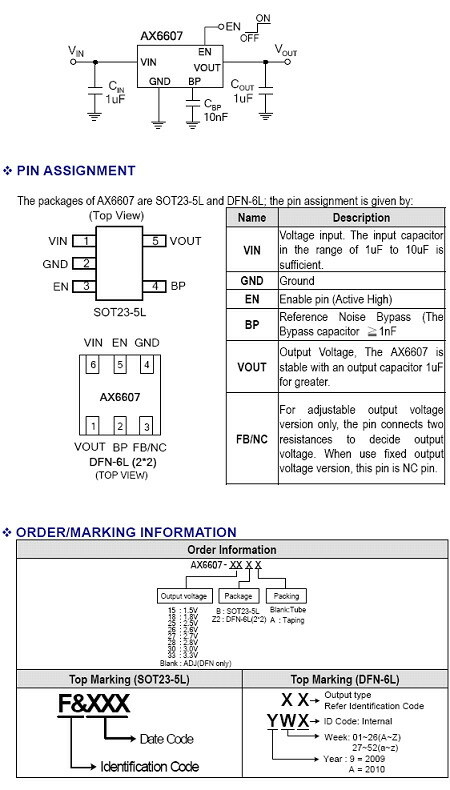 The AX6607 is a low dropout, positive linear regulator with very low quiescent. It can supply 600mA output current. The BP pin with a 10nF bypass capacitor can help reduce the output noise level. The characteristics of low dropout voltage and less quiescent current make it good for some critical current application, for example, some battery powered devices. The typical quiescent current is approximately 50μA. In the shutdown mode, the maximum supply current is less than 2μA. The AX6607 regulator is able to operate with output capacitors as small as 1μF for stability. The AX6607 series are offering several fixed output voltage types including 1.5V, 1.8V, 2.5V, 2.6V, 2.7V, 2.8V, 3.0V, 3.3V and adjustable version. Built in current-limit and thermal-shutdown functions prevent any fault condition from IC damage.